Life Before the Dinosaurs: Cameroceras (Part 1). Cameroceras was a huge orthocone which was one of the largest, or even the largest, animal in the Paleozoic Era. 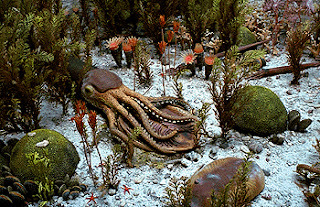 Cameroceras probably fed on everything it could get, such as eurypterids, anomalocarids, fish, trilobites, and even other nautiloids. Cameroceras looked like a squid inside a thin ice cream cone. It could have probably torn up any prey with its tentacles and gotten to the soft parts inside, if the prey had armor. 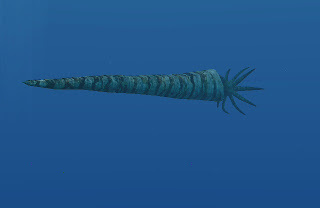 Cameroceras was a genus of giant orthocone. It was 17 feet, or possibly even larger. Its name means "chambered horn" because of the ring-shaped chambers it had along its shell, which probably helped it go up and down by holding air in to go up and letting it out to go down. Cameroceras may have even eaten other Cameroceras. 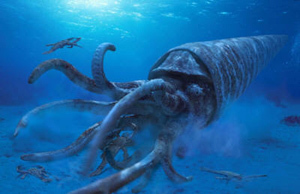 Cameroceras probably lived in deep water because if it was in shallow water it would not have been able to move because it was so huge. There was a cool Dinosaur Train episode about this one, I think.